The cold days of winter are an ideal time for sipping strong, dark, hearty beers that warm you from the inside out. Strong malt-forward beers come in several different styles including Imperial Stouts, Barleywines, Doppelbocks and Old Ales, but one of the most interesting families of strong beers are the Quadrupel Ales (quads) that originated in the Trappist Breweries of Belgium and the Netherlands. In this post I will introduce you to this distinctive style of beer, and then follow that up with a series of posts that report the results of four rounds of blind taste testing involving eight different people and fifteen different quads. The goal is to identify the distinctive character of each beer, so that you can make informed choices if you are inclined to take the plunge on this devout yet devilishly strong style of beer. Just for fun we will order the beers from best to worst at the end and determine which beer is deserving of the title “King of the Quads”. Belgian quads are dark, malt forward beers with little to no hop character. Their flavors are rich and complex with dark fruits (raisins, plums, figs, cherries), roasted malts (chocolate, caramel, butterscotch), and byproducts of the Belgian yeast strains used in fermentation (clove, black pepper). Occasionally additional spices are added, but unlike some styles (i.e. Winter Warmer) the spices are always subtle and meant to compliment the dark fruits and malts that are the star attraction. The alcohol levels are typically above 10% abv and can usually be perceived in the taste. Quads are normally bottle conditioned with some yeast and fermentable sugar added at bottling, and thus can be aged for several years. Quadrupel Ales, and their somewhat less potent relatives Tripels and Dubbels, originated in the Trappist Breweries of the Low Countries. To be designated as a Trappist brewery the beer must be brewed within the walls of the monastery under the supervision of monks, and the profits must be used for the upkeep of the monastery with any excess going to charity. 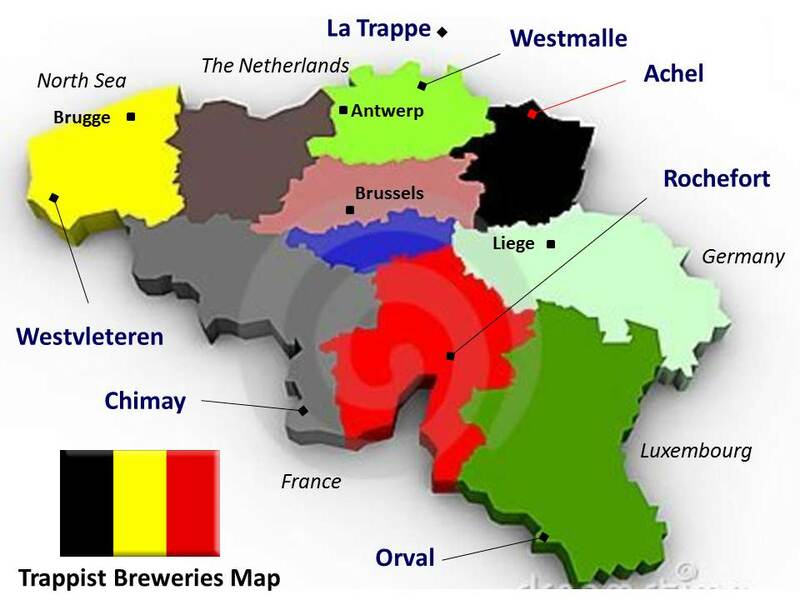 Until a couple of years ago there were seven Trappist breweries, six in Belgium (Westvleteren, Orval, Westmalle, Rochefort, Achel and Chimay) and one in the Netherlands (La Trappe). The past few years has seen that number increase with new Trappist breweries sprouting up in Austria (Stift Engleszell) and the United States (Spencer). 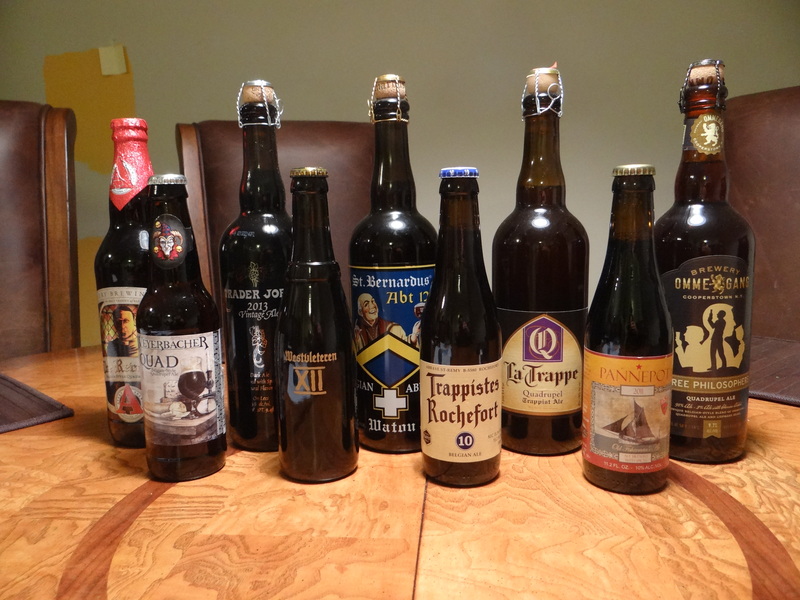 For an excellent history and description of the Trappist Breweries I would direct you to an excellent series of posts on Christopher Barnes blog “I think about beer”. Not all of the Trappist Breweries make a Quadrupel Ale, but Westvletern, Rochefort, La Trappe and Achel all make a strong dark ale that can be classified as a quad. Chimay Grande Reserve (Blue) is sometimes called a Quad, but at 9% abv it is on the borderline of a Quad and a Belgian Strong Dark Ale, as is Gregorius by Stift Engelszell (abv = 9.7%). Although Quadrupel Ales started with the Trappist Breweries, these days they are not the only breweries who make beers that fall into this style category. While everyone agrees that the alcohol content should increase as you go from a Dubbel to a Tripel to a Quadrupel, there is quite a bit of urban myth surrounding the origin and meaning of these names. A Quadrupel is not four times as strong as the elusive “Single”, nor is it fermented four times. One explanation you often see is that a Dubbel is made with twice the amount malt, a Tripel three times the malt, and a Quadrupel four times the malt as a Single, but Christopher Barnes dismisses this idea on his blog “I think about beer” and he tends to be a very reliable source on all things related to Belgian beer. I’d direct you to his post on this subject if you want a full explanation, but the take home message is that a Quadrupel is simply the name that has come to be used to classify the strongest Trappist Ales (generally abv > 10%). While some of the classic beers of this style have been in existence since the first half of the 20th century if not before (certainly the Trappist monasteries have been brewing beer for centuries) the term Quadrupel was not coined until 1991 by La Trappe to describe their strongest ale. In fact none of the other Trappist Breweries use the name Quadrupel in part because La Trappe has trademarked this name. The term abt, which is the Dutch word for abbot, is sometimes used for the strongest beer of a Trappist/Abbey brewery, St. Bernardus Abt12 for example. The logic in this naming scheme is that the strongest/finest beer was named in honor of the abbot, who is the leader of the monastery. Finally, it’s worth noting that there is a fine (imperceptible?) line between beers that are classified as a Belgian Strong Dark Ales and those classified as a Quadrupel Ales. Throughout the rest of this series I will use the term Quadrupel Ale or quad exclusively for any Belgian or Belgian-style ale with an alcohol content near 10% or higher. An important factor motivating this series on quads was the lucky series of events that resulted in me coming into the possession of two bottles of Westvleteren XII (Westy 12). Many of you will be familiar with the iconic status of Westy 12. It is the highest rated beer of any style on RateBeer.com with a rating of 4.45 (out of 5), which gives it a legitimate claim to call itself the best beer in the world. 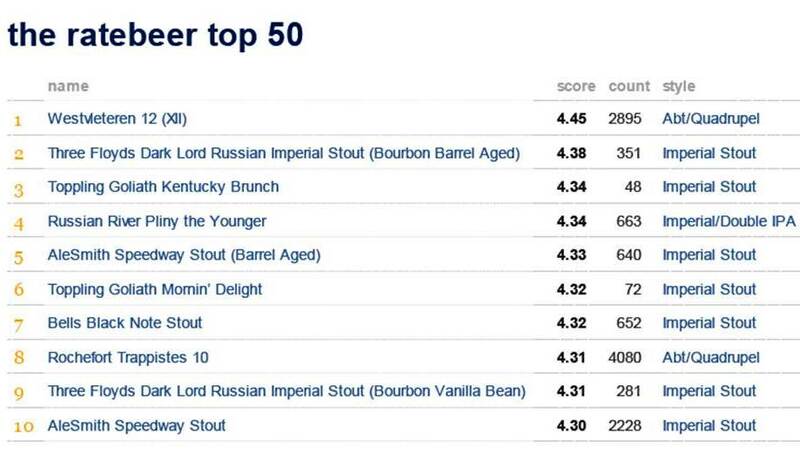 It also occupied the top spot in the statistical analysis of the preferences of “expert beer reviewers” as compiled by two Stanford economists, which I wrote a post about last fall. It is ranked #7 among all beers on BeerAdvocate.com, with a rating of 4.63 (the scores on BeerAdvocate tend to be a little higher than RateBeer). Westvleteren is the smallest of the Trappist breweries. Unlike the other Trappist breweries the monks at Westvleteren carry out all of the brewing operations. One generally has to visit the brewery to buy their beers and then only a limited number are sold (four per customer I’ve been told). A limited number of special 6 packs were made available in the USA for the first time last year to raise money for upgrading the brewery (at $85 per six pack). My friend Mike Lufaso, who lives in Jacksonville was able to snag a 6-pack of Westvleteren XII in early December 2012. We happened to meet up at a function in Washington, DC a couple of days later so he kindly agreed to sell me two beers from his 6-pack. I held onto these two beers for a year but I wanted to see how this legendary beer stacked up against its more readily available, though still somewhat pricey, peers. (Editors Note: If you are interested in the monk’s role in brewing at the various Trappist breweries check out Stan Hieronymus’ recent post, “How many monks does it take to …”). In this series of posts I will compare and contrast the ten different quads (or comparable beers). The beers that are vying for the title “King of the Quads” include three Trappist beers (Westvleteren XII, Rochefort 10, and La Trappe Quadrupel Ale), two non-Trappist entries from Belgium (St. Bernardus Abt12 and De Struise Pannepot), and five from North American Breweries (Three Philosophers by Brewery Ommegang, The Reverend by Avery, Weyerbacher Quad, Mad Elf by Tröegs, and Trader Joe’s Vintage Ale). Some might quibble with the inclusion of the last two beers that are not technically qualified as Quads, in which case feel free to lodge a complaint with International Trappist Association. At the end of round 3 I still hadn’t satiated my quad fix, so we sampled five more Quads in the supplementary round: Sierra Nevada’s Ovilla Quad, Dieu de Ciel’s Rigor Mortis, Chimay Grand Reserve, Stift Engellszell’s Gregorius, and Unibroue’s La Terrible. Finally I wrote up one final post where I attempt to rate all 15 quads that were part of the series. Thanks for linking to my page! I’m a big fan of Quads and am looking forward to reading more of this series. Thanks for encouragement. I wonder if you would consider Chimay Blue a quad? It’s been many years since I tried that one. It walks, talk, quacks like a quad. Besides, Quad is kind of a made up style. If you look at the BJCP, there isn’t a quad. They all fall under “strong” dark ale.